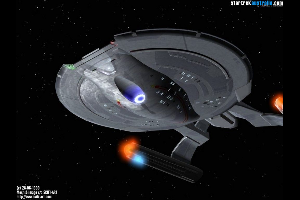 The Akira-class was a class of Federation starship that was in service with Starfleet by the early 2370s. This ship has a thru-deck hangar configuration. The arrangement of torpedo launchers is 3 forward, 2 aft in the rollbar, 2 forward above the deflector, 1 forward below the deflector, 2 each to port and starboard in the saucer. The deck listing includes the weapons pod. As such, the first four "decks" are essentially sub-decks while the ship proper begins on what would customarily be deck 5 but is, in this instance, deck 1. The sub-decks comprise the pod. IFS software - All Rights Reserved Obsidian Fleet RPG © 2001 - 2003.
Pegasus Fleet IFS Skin & Modifications - All Rights Reserved Pegasus Fleet RPG © 2019. Content on this site belonging to Pegasus Fleet may not be used without the expressed written permission of Pegasus Fleet. All content, except where noted, is © 2009 – 2019 Pegasus Fleet, All Rights Reserved, and is protected under copyright laws. Star Trek and all related marks are ©, ®, and ™ of CBS Paramount. Name and marks are used here for non-profit purposes and no copyright infringement is intended. This page generated by the IFS system. IFS originally created by Frank Anon for use in Obsidian Fleet, http://www.obsidianfleet.net. Modifications have been made by Matt Williams for use in Pegasus Fleet. See http://www.obsidianfleet.net/ifs/ for details on how to obtain this software. Page Rendered in: 0.039 seconds.